Long live the Tea Party! The surging force of ordinary grass roots Americans yearning for a smaller federal government, living within its means, getting the over-burdensome regulations out of the way of the small businesses and citizen entrepreneurs, and doing this with our country getting back to its basic constitutional roots, took hold near the end February in 2009. Despite attempts [including unconstitutional law breaking attempts by the IRS] by this administration and Democrats trying to silence the tea party groups around America, they are getting stronger and are determined to have an impact on American politics in 2014 and the future after that. The tea party organizations had a huge impact on the 2010 elections which resulted in an historic Republican sweep of Congress and state offices across this county. Because of that they became the number one group hated at and targeted by president Obama and liberal Democrats. Notwithstanding the coverup attempt by this administration of the IRS scandal, information has come out slowly but surely showing that this administration has used the IRS in attempt to shut them down before the 2012 presidential election. That attempt is continuing today with a cover-up from not only the president but the attorney general and the willing useful idiot accomplices in the main stream media. 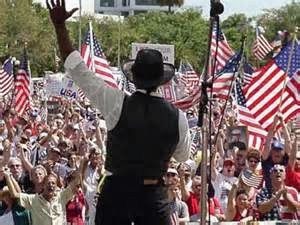 It worked in 2012 in helping president Obama get re-elected but now that the cat is out of the bag, the tea party groups, even still being harassed and not being given their status by the IRS, are standing strong and determined to be even stronger than ever. While we celebrate the 5 year anniversary of the tea party, let us never forget what great American gave the idea that resulted in this new American phenomenon known as the tea party. It was a rant on the floor of the Chicago Mercantile Exchange by CNBC reporter Rick Santelli.